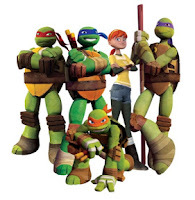 NickUKHub: Nickelodeon UK & Ireland to Show Brand New Teenage Mutant Ninja Turtlesin February 2013! Nickelodeon UK & Ireland to Show Brand New Teenage Mutant Ninja Turtlesin February 2013! According to Nick UK & Ireland's online TV schedule, Nickelodeon UK & Éire will show brand new episodes of the all action Nicktoon 'Teenage Mutant Ninja Turtles' from February 9th 2013 at 9:30am, and then new episodes every Saturday. Below is a list of episodes that will premiere. All the episodes names have been changed from the US names, for unknown reasons.